The Villa Sunlight are a unique living concept. The villa are situated in a nice and quiet area, close to Sitges center and beaches with fantastic views of the sea and the mountains. The villa Sunlight has 2 floors, capacity for up to 14 persons There is more than 190 square meters constructed indoor living space; living & dining room, kitchen, hall, bedrooms, toilets & bath, plus four large sun terraces & pool, all with fantastic views. There is a private guest entrance and the guest have access to a private pool where you also have panoramic views of the sea and mountains. The villa are only a 15 minute walk to neatest beach & supermarket and around 25 minutes walk to the city center of Sitges. or 3-5 minutes by car/taxi, or 10-15 minutes by bus. On request the villa reception offer; breakfast buffet, homemade meals, massage, excursions, airport transfers & sightseeing. There are 3 modern bathrooms with toilet, shower and bath tub. An open plan kitchen, dining & living room. With large table and seating for up to 12 people. There is also a bed settee and armchairs. There is a terrace with lovely views leading off the lounge. Incl. DVD, TV & WI-FI. Fully equipped with fridge/freezer, gas/electric oven, microwave, dishwasher and washing machine, etc. Jetski and waterski in Aigua-Dolce the port of Sitges (3 mins with car). 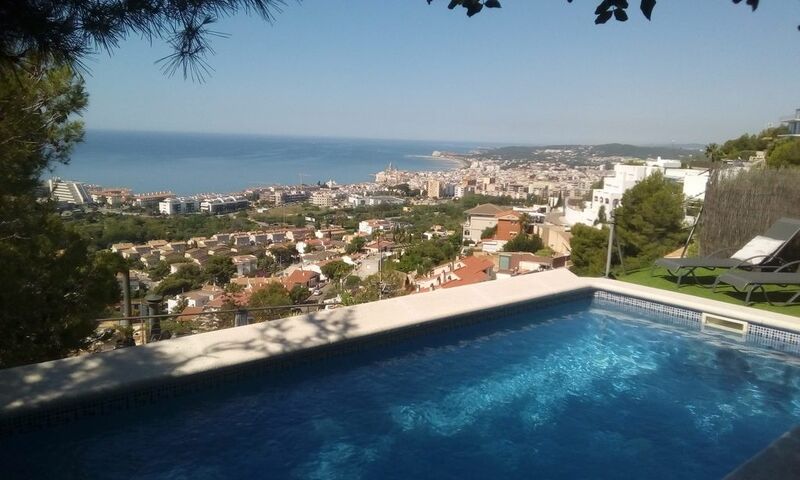 Notes on accommodation: Villa Sunlight are situated in a beautiful setting in the mountains overlooking Sitges with wonderful sea views. There are fans in every room and air condition in some of the rooms (Note air condition is extra charged) In wintertime its also heated with gas radiators and with a fire stove. Outside: The villas have lots of out door space with lovely sun terraces with dining furniture and chairs. Private pool with amazing views of the sea. The pool is surrounded with a little garden and wild wonderful smell of pine trees. The pool is unheated and private. Utility Room: Chill out terrace/lounge with barbecue equipment. Cleaning / Towels / Linen / Maid service: Bed linen, towels is provided. Included in the price: Final cleaning, "Gastos" bills for elec, water, gas, and WIFI. The villa is fairly up to date, with fabulous, views especially from the pool area. A good wee walk to Sitges however none of us minded. I wouldn’t recommend this villa to anyone not fit or with young children. The pool is at the top of the villa and to get there you have to climb several man-made steps! Not very safe especially in the evenings as the light around the pool was minimal. Because of this we barred all the teenagers from the pool in the evenings. The owners had led us to believe that they could pick us up from the airport however they weren’t able to and weren’t very helpful as how to get there.When we eventually got to the villa, via bus, there was no great welcome we all felt that there could have been more communication as to the running of the villa. On our return we arranged a taxi which was great if only we had have known this on arrival! We really had a great time in Sitges, such a beautiful place,despite all this as it was a myself and two sisters and our families however unfortunately we wouldn’t be recommending this villa more because of the lack of communication and support from the owners than anything else. Where do we start with this villa??? Lovely, spacious and the most wonderful views. Just back from a 4 night stay at Villa Sunlight. 9 girls in our group. This is my 3rd trip to Sitges, which is a fabulous place.
. Conny and Gunilla are great. We paid for them to pick us up and return us to the airport. Where possible, if we needed to go to the Supermarket or into the centre of Sitges, they would give us a lift for four euros.
. The most fabulous views over Sitges and the sea, from the villa and all the terraces and pool area.
. Water cooler in the kitchen area, which we just paid for refill containers, which is a great idea and we found that we drank more water because of it being there! Healthy bonus!
. Although we bought our own to prepare, we had lunch one day at the villa, provided by Gunilla and Conny. At eighteen euros each, it was lovely.
. Plenty of space, so could either all get together, or if needed, some time on your own, this was possible as well.
. No air con, although, because of the height of the location there was a sea breeze. But with some menopausal women in the group, air con always welcome!
. A lot of steps to get to the villa and each terrace and pool area, would not recommend if someone was infirm or very unfit. I wouldn't take young children, due to this reason as well. Those steps certainly kept us fit! Around a thirty minute walk to the centre. The last time we stayed, we were near the centre which was very handy. However, the upside to being further away and higher up was the fab views from the villa, so it depends what you prefer! As for Sitges, whether you want to go to Gay Pride or otherwise, it is a beautiful place. We have twice gone to Sitges for the gay pride weekend, and whether you are straight or gay, it is a brilliant atmosphere and the best fun. Equally, I would be quite happy going to Sitges with my husband and two young children. Look forward to my return! Amazing villa...gorgeous pool & out door area. Perfect for our girlie holiday. Definitely recommend this villa as an ideal place to relax & unwind. The views are amazing & all the rooms clean & spacious. The large bedroom on the top floor was breathtaking & we loved the outdoor terrace & view. The kitchen was fully equipped & Conny as always on hand to drive us down to the town when we needed. There are lots of steps up to the villa & it is situated high up a steep hill - so could be a challenge to some less able. We stayed at Villa Sunlight from September 16th - 19th 2016 and have the most fantastic time!! The owners were nothing less than amazing, and helped us with absolutely everything from the point of enquiry, until the point of departure. We cannot thank them enough. And they were so kind and tolerant with us all not speaking Spanish - and being a group of 5 over excited woman on a girls trip! The Villa is very pretty, the views from the Terrace the swimming pool are amazing, the photos are not exaggerated at all! Inside the Villa it is very spacious and light, and it is plenty big enough for a party of 10. The options for meals, fun, shopping, sunbathing, relaxing, partying nearby are vast. We wish we could have stayed longer, and we would definitely go back! A huge thank you to Conny, and we would absolutely recommend this Villa to anyone looking for a break in the Sitges/Barcelona area. As a guest we are happy to help you with everything you wish to do during your stay. The villa reception on ground floor and totally separated from renters area, offer affordable activities (excursions, transfers) and service (meals and massage) during the stay that can be held at the villa or in the local area. We offer activities such as birthday celebrations, sightseeing, excursions to local wine & food venues. We can arrange and advise on local nightlife highlights in Sitges or Barcelona. Airport transfers with personal guide. Sitges/Garraff have more than 11 lovely beaches. The nearest beach is a 10 minute walk or a 3 minute car journey. Barcelona Airport 25 mins. Girona Airport and Reus airport/ Tarragona = 1 hour 20 mins. To Sitges center 3 - 25 mins (car/bus/walk). To beaches 3 - 20 mins (car/walk). To Barcelona 25 - 45 mins (with car/train). We always give a nice welcoming with cava (spanish champagne and personal information of all the good restaurants, bars and the best Sitges/Barcelona, sightseeing trips). Shops, banks, bars and restaurants are all within 3-5 minutes by car or 15-25 minute walk. We provide you with information on activities etc in the area. We always give nice welcoming with "cava" Spanish champagne and personal information of all the good restaurants, bars and best Sitges/Barcelona, sightseeing etc. The house reception offer you different services on request: updated tourist information & sightseeing, rooms service, vineyard excursions, homemade meals & catering, golf and tennis nearby. Ground floor is used for special dinner events, breakfast or extra space for bigger groups.The house reception & ground floor is totally separated from 1:st & 2:nd floor which is normal used as renters area. Booking Notes: Booking must be made by email and a 30% deposit is required in advance to secure the booking. The balance is to be paid on arrival or transferred to our bank account. One deposit of 200 euros (in case of damages) is required on arrival. Changeover Day: Minimum 2 days staying. Friday or Saturdays are normally the day of change over. You have access to the house from 16.00 hours. And are avaliable to stay in the house until 11 o clock on the departure day. Notes on prices: Ask for our affordable last minute prices and notice that we are always negotiable. Spring Special: midweek & weekend price = from 690 EUR/week or 250 EUR/night = 6 persons + extra persons. We wish You a warm welcome to a fantastic venue with unique services -all for make your holiday to an extraordinary & a pleasant experience!